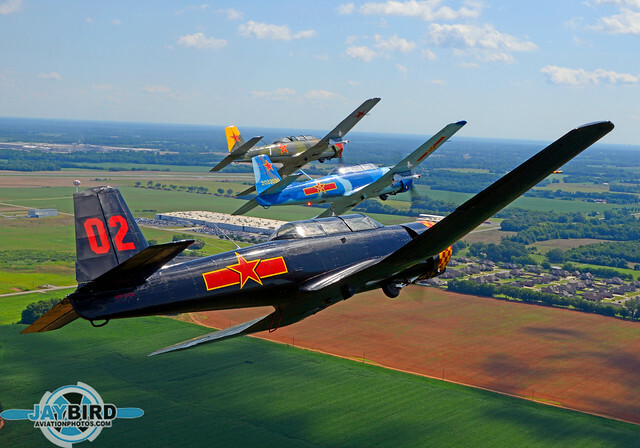 Since diving into the warbird community, the Redstar Pilots Association (RPA) has been a big part of my life. 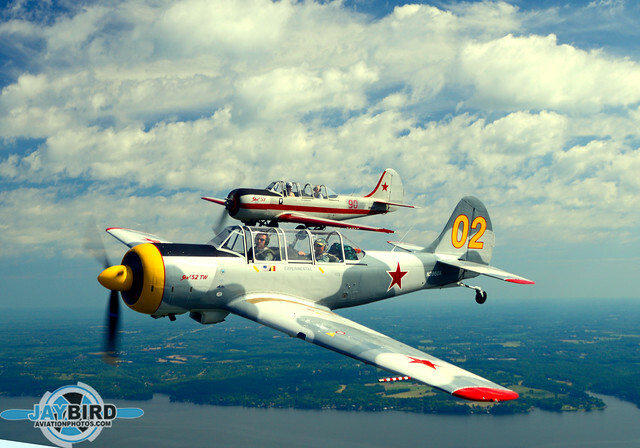 True, I have formed a good relationship with several other organizations such as the North American Trainer Association (NATA), the Classic Jet Aircraft Association (CJAA), and the T-34 Association, but the RPA is what I really call home. Several people have been instrumental in this relationship. 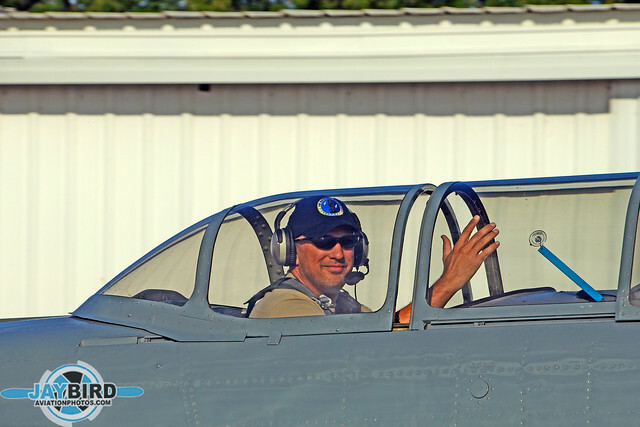 Doug Glover of 3G Aviation Media gave me my first opportunity to fly with the RPA and remains my Number One mentor. 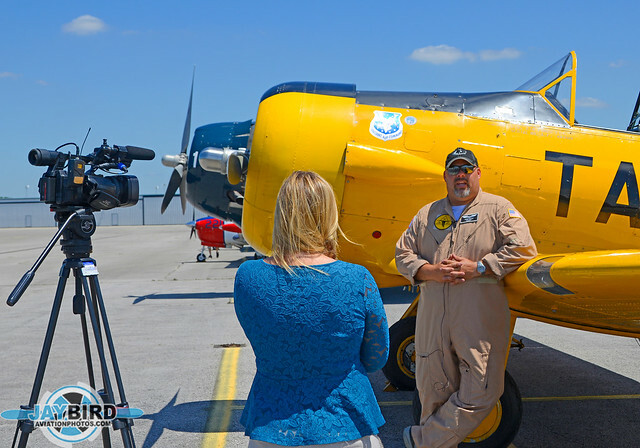 Scott “Munchie” Andrews, Director of the Southwest Region of the RPA, invited me to his formation flying clinic at Falcon Field, and opened my eyes to this event, and others like it. Robert “Speedo” Genat, is the editor of Red Alert, the quarterly publication of the RPA, who flatly rejected my first article. However, he gave me another chance, and I am now the National Correspondent for Red Alert. Chris “Bandit” Davis gave me a heads-up about Rally on the River, and that led to my first meeting with Jon “Saber” Blake, the Director of the Southeast Region of the RPA. And the rest, as they say, is history. I am proud to call all of these men my friends. Here is that story. 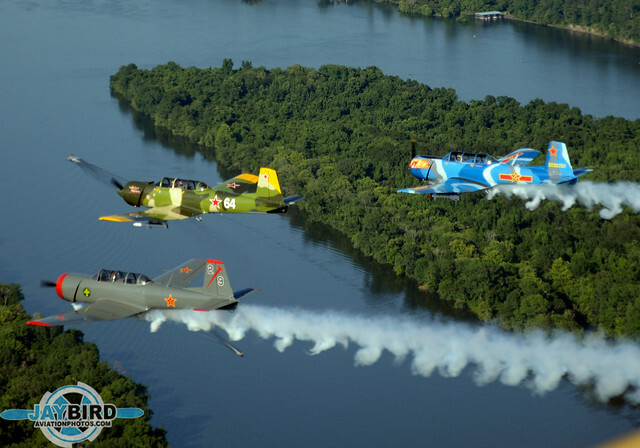 This year, during a meeting of the local Experimental Aircraft Association, Barry Griffith, Airport Director for the Northwest Alabama Regional Airport (MSL) said he wanted to work with Kennamore to organize a major presence of warbirds at the June 10 event, officially called “Rally on the River”. Kennamore, a longtime resident and local businessman, began pounding the pavement. “I know the mayors of the four local cities surrounding the airport, so I met with each of them to solicit their help. With their blessings and support, I went to the tourism board. Response was overwhelming. Three hotels donated rooms for visiting pilots and banks donated cash. Several vendors offered to donate everything from food to vehicles for the event. 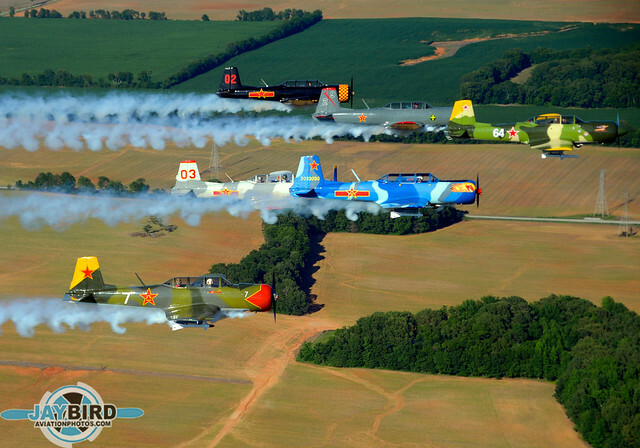 We received overwhelming support from the entire local community.” And, of course, there were airplanes. Lots of them, especially for a small regional airport like MSL. 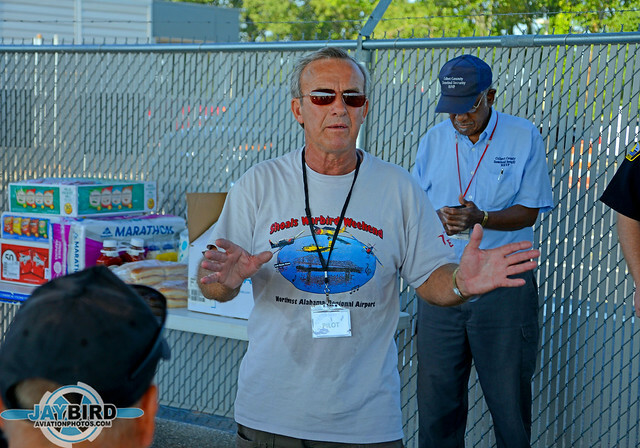 Jon “Saber” Blake, Southeast Regional Director of the Redstar Pilots Association, helped drum up support among fellow Redstar Pilots, and additional fellow aviators arrived flying everything from RVs to a TBM Avenger. Griffith arranged to open the MSL ramp to visitors who, for a donation, could get up close and personal with planes AND pilots. He also arranged to provide fuel at cost. 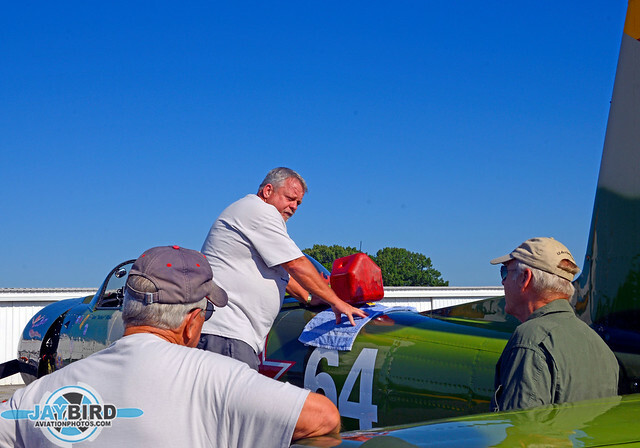 By all accounts, the event was an overwhelming success with over 40 various aircraft in attendance. Although Bandit was the only person I’d actually met before that weekend, he “introduced” me to quite a few members of the SE Region of the RPA by tagging on Facebook a number of the photos I took at Sun ‘n Fun earlier in 2017. So at least I knew a couple of names. Additionally, I’d offered to write about the event for Red Alert, so Speedo contacted Saber and BJ to let them know I would be there. I can only imagine their reactions to the news that there was going to be one more photographer at Muscle Shoals. After all, the SE Region RPA already has two extremely talented photographers, Chris Dilley and Ron “Jammer” Malec, so I was quite conscious about treading softly and not stepping on any toes. I was pleasantly surprised at the warm reception by everyone at MSL. BJ shared his mantra that “If there are no pictures, it didn’t happen.” Saber was delighted that the Southeast Region was going to get some press in Red Alert. He also pulled me aside to share some words of wisdom which I still follow to this day. Chris Dilley kindly showed me the ropes as a “PhotoGIB” (Guy In Back), both in terms of flying with the RPA pilots, and also specific photo skills. 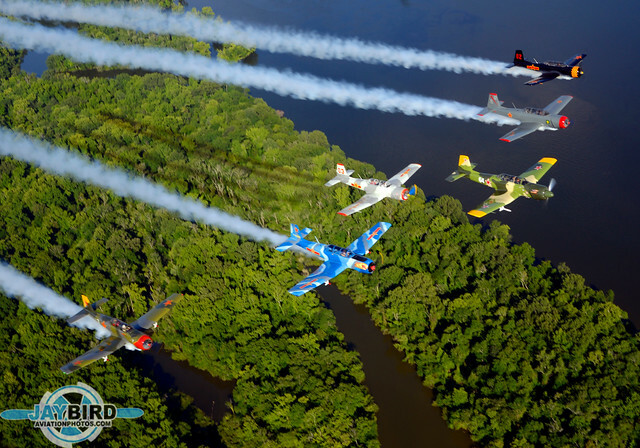 And Bandit offered to take me up in the T-6 to take photos of the mass formation that we flew on the first evening. 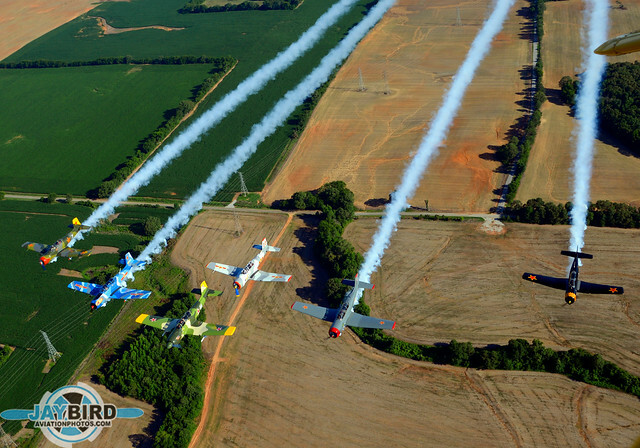 Over the Three-Day event, I had a chance to go flying several times, and took LOTS of photos. More importantly, I had a chance to meet a terrific group of aviators. You never really know everything you don’t know, but at least I was aware that there was a lot that I didn’t know. (There’s STILL a lot I don’t know!) I really appreciated the fact that people like Saber and Dilley took the time to explain some of the facts of life. This was my first event with the aviators from the RPA SE Region and everyone involved made me feel welcome and right at home. 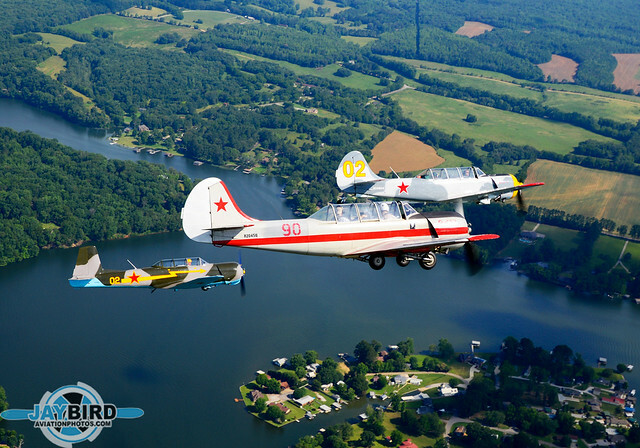 We flew one flight specifically as a photo flight, but all of our flights took into consideration the wishes of the photographers, Chris Dilley and myself. BJ Kennamore reiterated his belief that, “If you don’t have pictures, it didn’t happen.” Chris Dilley and I have plenty of proof that Rally on the River did, in fact, happen! 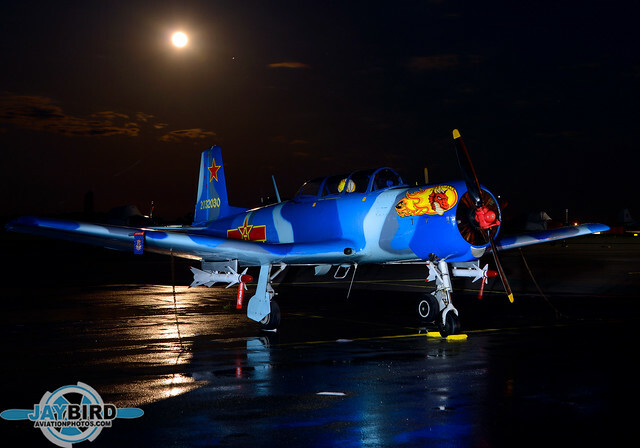 I first saw Greg Wrobel’s eye-catching CJ-6 at Sun ‘N Fun, so I was very happy to be able to take this portrait of his plane.. 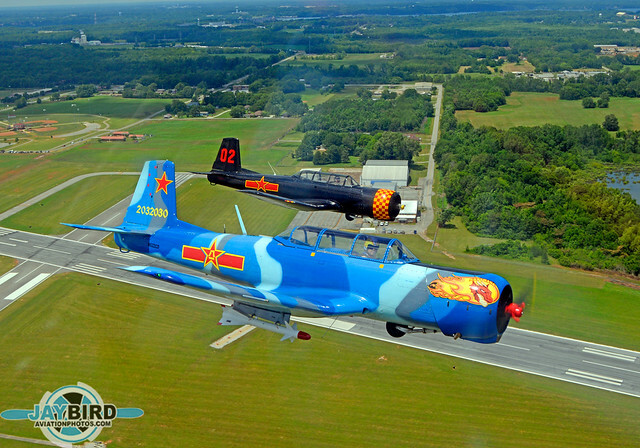 So how does a German aviator flying a Russian airplane wind up with the call sign “Chinaman”? It’s a LONG story! 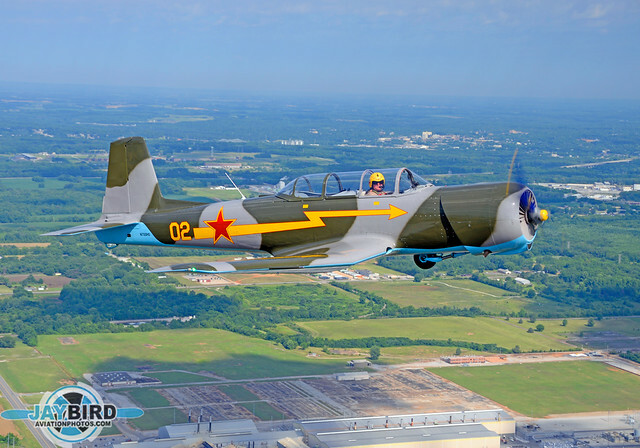 But he sure has a good-looking Yak-52TW. 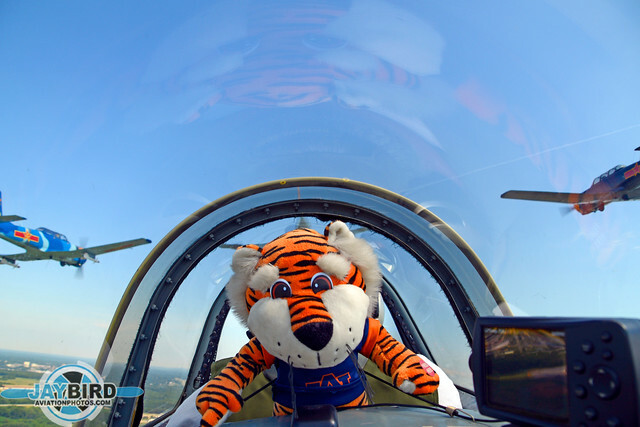 Saber does not fly anywhere without “Aubie”, who keeps a close eye on my every move! Saber is now one of my closest friends, and I count several other RPA members among my good friends. This is unquestionably the best thing to have come out of those humble beginnings at Muscle Shoals. 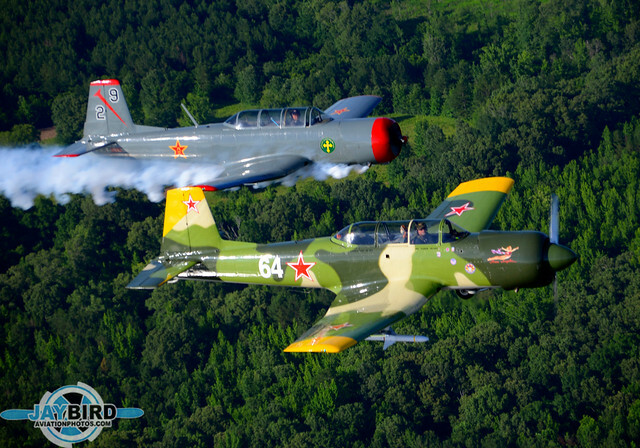 Saber told me, “You came here as an unknown, but you’re leaving as the newest member of the Redstar Pilots Association Southeast Region.” It was a good weekend for the RPA, and a proud weekend for me!